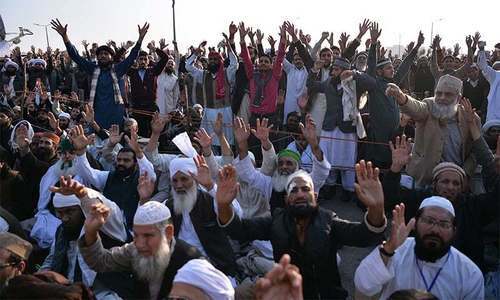 The citizens of the provincial capital continued to suffer as the Tehreek-e-Labaik Pakistan (TLP) sit-in outside Data Darbar entered its ninth day on Tuesday. The sit-in had resulted in business activities in the area coming to a halt, shutdown of schools in the adjoining areas and traffic congestion which left the citizens agitated. As a result, a large part of The Mall had been closed with containers and barriers while the road leading from Nasir Bagh to Minar-e-Pakistan had been closed for traffic. The traffic from Nasir Bagh had been diverted towards Abdul Qadir Jilani road while the circular road has also been closed from Bhaati Chowk onwards. Commercial activity suffered as the furniture shops and a well-known bakery had been closed for the past nine days. There is a bird market right in front of the sit-in which now exhibits signs of isolation. Whether this situation would continue or not depends on the April 12 deadline given by the religious party to the government. The lack of efforts from the government officials to resume the dialogue process resulted in the continuation of the deadlock. The protesters demanded that the Faizabad agreement be enforced. TLP Chief Khadim Hussain Rizvi warned that the failure to meet the deadline would result in a country-wide strike. A party spokesperson said that the government must fulfil the party’s demands if they wanted to avoid any incident from occurring. According to TLP leaders, the protest would be extended to other cities if the government failed to carry out the terms decided upon in the army-brokered Faizabad agreement. The Lahore High Court (LHC) also heard a petition seeking the removal of the protesters. The petitioner, Abdullah Malik, contended that the protesters were violating people’s basic human rights by blocking the road and added that it was unconstitutional. He appealed to the court to issue orders to end the sit in. TLP chief and leaders were declared proclaimed offenders by an anti-terrorism court (ATC) in Islamabad. However, law enforcement agencies had been unable to make any arrests.